I have studied all the photos available of Sir Nigel – at different ages – and know that I want a likeness of him in his late 50s/early 60s. This is when he was Chief Mechanical Engineer for London and North Eastern Railway. 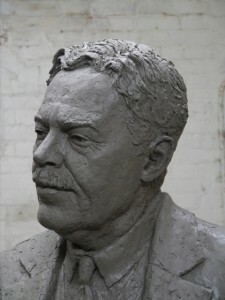 Sir Nigel Gresley’s head develops over the five months I am sculpting the figure in clay. Sculpting heads is very much in my comfort zone, so I was in no hurry to complete the portrait. I wanted time to get a feel for proportions of the head in relation to the body. 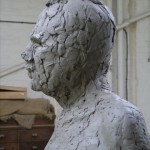 This is the proportion of Sir Nigel’s head to his body but also what proportions would work for this larger-than-life sculpture. As with any portrait, I work out the scale first, then how the head sits on the body, and then the angle of the head in the selected pose. Some of this is worked-out during the armature building stage. But there is always a need to continually re-think and make minor adjustments. There is a point when I decide that the head has got too large. It has followed the proportions of the maquette too slavishly. 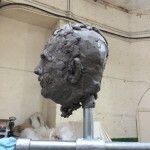 So – with some difficulty – I lift off the head, remove some of the clay and adjust the armature. Once lifted back on, I am pleased with the decision. I spend a lot of time on the structure of the head – getting the side profile of the head and the shape of the skull right. I then move onto the brow, cheekbones and jaw. The detail of the features, such as eyes, nose and mouth, come later. For all of this I need to be up ladders. In order to stand back and get a good look at what I am doing, I need to come down the ladder and climb up another ladder positioned a couple of metres away. This slows progress, but it is sure progress.